It symbolizes the struggle between man and beasts. The three acts of the drama are the entry, the planting of the banderilleros, and the death of the bull. A Canadian at ringside. It was spring in Paris and everything looked just a little too beautiful. Mike and I decided to go to Spain. Strater drew us a fine map of Spain on the back of a menu of the Strix restaurant. On the same menu he wrote the name of a restaurant in Madrid where the specialty is young suckling pig roasted, the name of the pensione on the Via San Jerónimo where the bullfighters live, and sketched a plan showing where the Grecos are hung in the Prado. Fully equipped with this menu and our old clothes, we started for Spain. Our objective—to see bullfights. We left Paris one morning and got off the train at Madrid the next noon. We saw our first bullfight at 4:30 that afternoon. It took about two hours to get tickets. We finally got them from scalpers for twenty-five pesetas apiece. The bullring was entirely sold out. We had barrera seats. These, the scalper explained in Spanish and broken French, were the first row of the ringside, directly under the royal box, and immediately opposite where the bulls would come out. We asked him if he didn’t have any less distinguished seats for somewhere around twelve pesetas, but he was sold out. So we paid the fifty pesetas for the two tickets, and with the tickets in our pockets sat out on the sidewalk in front of a big café near the Puerta del Sol. It was very exciting, sitting out in front of a café your first day in Spain with a ticket in your pocket that meant that rain or shine you were going to see a bullfight in an hour and a half. In fact, it was so exciting that we started out for the bullring on the outskirts of the city in about half an hour. The bullring or Plaza de Toros was a big, tawny brick amphitheater standing at the end of a street in an open field. The yellow and red Spanish flag was floating over it. Carriages were driving up and people getting out of buses. There was a great crowd of beggars around the entrance. Men were selling water out of big terra-cotta water bottles. Kids sold fans, canes, roasted salted almonds in paper spills, fruit and slabs of ice cream. The crowd was gay and cheerful but all intent on pushing toward the entrance. Mounted civil guards with patent-leather cocked hats and carbines slung over their back sat their horses like statues, and the crowd flowed through. Inside they all stood around in the bullring, talking and looking up in the grandstand at the girls in the boxes. Some of the men had field glasses in order to look better. We found our seats and the crowd began to leave the ring and get into the rows of concrete seats. The ring was circular—that sounds foolish, but a boxing ring is square—with a sand floor. Around it was a red board fence—just high enough for a man to be able to vault over it. Between the board fence, which is called the barrera, and the first row of seats ran a narrow alleyway. Then came the seats which were just like a football stadium except that around the top ran a double circle of boxes. Every seat in the amphitheater was full. The arena was cleared. Then on the far side of the arena out of the crowd, four heralds in medieval costume stood up and blew a blast on their trumpets. The band crashed out, and from the entrance on the far side of the ring four horsemen in black velvet with ruffs around their necks rode out into the white glare of the arena. The people on the sunny side were baking in the heat and fanning themselves. The whole sol. side was a flicker of fans. Behind the four horsemen came the procession of the bullfighters. They had been all formed in ranks in the entranceway ready to march out, and as the music started they came. In the front rank walked the three espadas, or toreros, who would have charge of the killing of the six bulls of the afternoon. They came walking out in heavily brocaded yellow and black costumes, the familiar “toreador” suit, heavy with gold embroidery, cape, jacket, shirt and collar, knee breeches, pink stockings, and low pumps. Always at bullfights, afterward the incongruity of those pink stockings used to strike me. Just behind the three principals—and after your first bullfight you do not look at their costumes but their faces—marched the teams, or cuadrillas. They are dressed in the same way but not as gorgeously as the matadors. Back of the teams ride the picadors. Big, heavy, brown-faced men in wide flat hats, carrying lances like long window poles. They are astride horses that make Spark Plug look as trim and sleek as a King’s Plate winner. Back of the pics come the gaily harnessed mule teams and the red-shirted monos, or bullring servants. The bullfighters march in across the sand to the president’s box. They march with easy professional stride, swinging along, not in the least theatrical except for their clothes. They all have the easy grace and slight slouch of the professional athlete. From their faces they might be major league ball players. They salute the president’s box and then spread out along the barrera, exchanging their heavy brocaded capes for the fighting capes that have been laid along the red fence by the attendants. We leaned forward over the barrera. Just below us the three matadors of the afternoon were leaning against the fence talking. One lighted a cigarette. He was a short, clear-skinned gypsy, Gitanillo, in a wonderful gold brocaded jacket, his short pigtail sticking out under his black cocked hat. “He’s not very fancy,” a young man in a straw hat, with obviously American shoes, who sat on my left, said. “You’re an American, aren’t you?” asked Mike. I had noticed Villalta. He was straight as a lance and walked like a young wolf. He was talking and smiling at a friend who leaned over the barrera. Upon his tanned cheekbone was a big patch of gauze held on with adhesive tape. “He got gored last week at Málaga,” said the American. Out in the arena the picadors had galloped their decrepit horses around the ring, sitting straight and stiff in their rocking-chair saddles. Now all but three had ridden out of the ring. These three were huddled against the red painted fence of the barrera. Their horses backed against the fence, one eye bandaged, their lances at rest. In rode two of the marshals in the velvet jackets and white ruffs. They galloped up to the president’s box, swerved and saluted, doffing their hats and bowing low. From the box an object came hurtling down. One of the marshals caught it in his plumed hat. “The key to the bullpen,” said the Gin Bottle King. The two horsemen whirled and rode across the arena. One of them tossed the key to a man in torero costume, they both saluted with a wave of their plumed hats, and had gone from the ring. The big gate was shut and bolted. There was no more entrance. The ring was complete. The crowd had been shouting and yelling. Now it was dead silent. The man with the key stepped toward an iron-barred, low, red door and unlocked the great sliding bar. He lifted it and stepped back. The door swung open. The man hid behind it. Inside it was dark. For the bull was absolutely unbelievable. He seemed like some great prehistoric animal, absolutely deadly and absolutely vicious. And he was silent. He charged silently and with a soft, galloping rush. When he turned he turned on his four feet like a cat. When he charged the first thing that caught his eye was the picador on one of the wretched horses. The picador dug his spurs into the horse and they galloped away. The bull came on in his rush, refused to be shaken off, and in full gallop crashed into the animal from the side, ignored the horse, drove one of his horns high into the thigh of the picador, and tore him, saddle and all, off the horse’s back. The bull went on without pausing to worry the picador lying on the ground. The next picador was sitting on his horse braced to receive the shock of the charge, his lance ready. The bull hit him sideways on, and horse and rider went high up in the air in a kicking mass and fell across the bull’s back. As they came down the bull charged into them. The dough-faced kid, Chicuelo, vaulted over the fence, ran toward the bull and flapped his cape into the bull’s face. The bull charged the cape and Chicuelo dodged backward and had the bull clear in the arena. Without an instant’s hesitation, the bull charged Chicuelo. The kid stood his ground, simply swung back on his heels and floated his cape like a ballet dancer’s skirt into the bull’s face as he passed. The bull whirled and charged again. Without moving, Chicuelo repeated the performance. His legs rigid, just withdrawing his body from the rush of the bull’s horns and floating the cape out with that beautiful swing. Again the crowd roared. The Kid did this seven times. Each time the bull missed him by inches. Each time he gave the bull a free shot at him. Each time the crowd roared. Then he flopped the cape once at the bull at the finish of a pass, swung it around behind him and walked away from the bull to the barrera. The chubby-faced Kid who did not like bullfighting and had just done the seven wonderful veronicas was standing against the fence just below us. His face glistened with sweat in the sun but was almost expressionless. His eyes were looking out across the arena where the bull was standing making up his mind to charge a picador. He was studying the bull because a few minutes later it would be his duty to kill him, and once he went out with his thin, red-hilted sword and his piece of red cloth to kill the bull in the final set it would be him or the bull. There are no drawn battles in bullfighting. I am not going to describe the rest of that afternoon in detail. It was the first bullfight I ever saw, but it was not the best. The best was in the little town of Pamplona high up in the hills of Navarre, and came weeks later. Up in Pamplona, where they have held six days of bullfighting each year since A.D. 1126, and where the bulls race through the streets of the town each morning at six o’clock with half the town running ahead of them. Pamplona, where every man and boy in town is an amateur bullfighter and where there is an amateur fight each morning that is attended by 20,000 people in which the amateur fighters are all unarmed and there is a casualty list at least equal to a Dublin election. 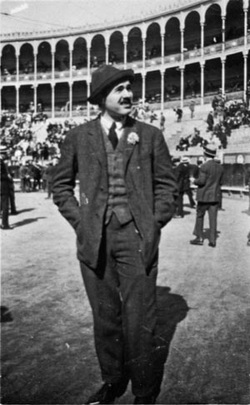 But Pamplona, with the best bullfight and the wild tale of the amateur fights, comes in the second chapter. I am not going to apologize for bullfighting. It is a survival of the days of the Roman Colosseum. But it does need some explanation. Bullfighting is not a sport. It was never supposed to be. It is a tragedy. A very great tragedy. The tragedy is the death of the bull. It is played in three definite acts. The Gin Bottle King—who, by the way, does not drink gin—told us a lot of this that first night as we sat in the upstairs room of the little restaurant that made a specialty of roast young suckling pig, roasted on an oak plank and served with a mushroom tortilla and vino rojo. The rest we learned later at the bullfighters’ pensione in the Via San Jerónimo, where one of the bullfighters had eyes exactly like a rattlesnake. Much of it we learned in the sixteen fights we saw in different parts of Spain from San Sebastian to Granada. At any rate bullfighting is not a sport. It is a tragedy, and it symbolizes the struggle between man and the beasts. There are usually six bulls to a fight. 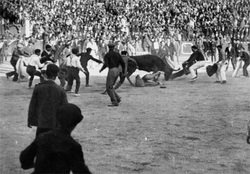 A fight is called a corrida de toros. Fighting bulls are bred like race-horses, some of the oldest breeding establishments being several hundred years old. A good bull is worth about $2,000. They are bred for speed, strength and viciousness. In other words a good fighting bull is an absolutely incorrigible bad bull. Bullfighting is an exceedingly dangerous occupation. In the sixteen fights I saw there were only two in which there was no one badly hurt. On the other hand it is very remunerative. A popular espada gets $5,000 for his afternoon’s work. An unpopular espada though may not get $500. Both run the same risks. It is a good deal like Grand Opera for the really great matadors except they run the chance of being killed every time they cannot hit high C.
The three absolute acts of the tragedy are first the entry of the bull when the picadors receive the shock of his attacks and attempt to protect their horses with their lances. Then the horses go out and the second act is the planting of the banderillos. This is one of the most interesting and difficult parts but among the easiest for a new bullfight fan to appreciate in technique. The banderillos are three-foot, gaily colored darts with a small fishhook prong in the end. The man who is going to plant them walks out into the arena alone with the bull. He lifts the banderillos at arm’s length and points them toward the bull. Then he calls “Toro! Toro!” The bull charges and the banderillero rises to his toes, bends in a curve forward and, just as the bull is about to hit him, drops the darts into the bull’s hump just back of his horns. They must go in evenly, one on each side. They must not be shoved, or thrown or stuck in from the side. This is the first time the bull has been completely baffled, there is the prick of the darts that he cannot escape and there are no horses for him to charge into. But he charges the man again and again and each time he gets a pair of the long banderillos that hang from his hump by their tiny barbs and flop like porcupine quills. Last is the death of the bull, which is in the hands of the matador who has had charge of the bull since his first attack. Each matador has two bulls in the afternoon. The death of the bull is most formal and can only be brought about in one way, directly from the front by the matador, who must receive the bull in full charge and kill him with a sword thrust between the shoulders just back of the neck and between the horns. Before killing the bull he must first do a series of passes with the muleta, a piece of red cloth about the size of a large napkin. 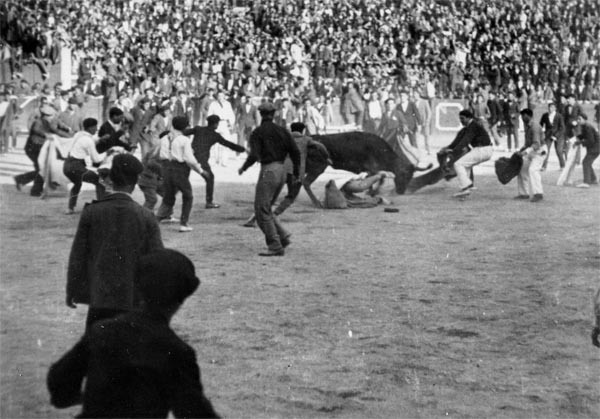 With the muleta, the torero must show his complete mastery of the bull, must make the bull miss him again and again by inches, before he is allowed to kill him. It is in this phase that most of the fatal accidents occur. The word “toreador” is obsolete Spanish and is never used. The torero is usually called an espada, or swordsman. He must be proficient in all three acts of the fight. In the first he uses the cape and does veronicas and protects the picadors by taking the bull out and away from them when they are spilled to the ground. In the second act he plants the banderillos. In the third act he masters the bull with the muleta and kills him. Few toreros excel in all three departments. Some, like young Chicuelo, are unapproachable in their capework. Others like the late Joselito are wonderful banderilleros. Only a few are great killers. Most of the greatest killers are gypsies. The Toronto Star Weekly, Oct. 20, 1923.